What is Folk for Kidz or children's music? Well for me there are different categories - there are those musicians who specialise in music for children; there is music which is not aimed at children but children will love it; and then there are one-off albums with music for children from artists who do not normally perform childrens music. And then there is a grey area between all of those. This time I introduce you to one childrens' performer, and one of those "grey area" albums. 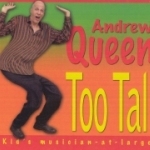 Andrew Queen, Too Tall - Kid's musician-at-large. Own label, 2010. The album of children's singer Andrew Queen from Canada starts with a real hit - "Big troubles for Little Red" is a very clever and catchy, and excellently arranged song about Little Red Riding Hood. Top marks for that song. The CD "Too tall" might not stay on the same level as its first song, but it is still a very recommendable children's album. There are a couple of other songs written by Andrew himself; the remainder is principly traditional, with most songs less known on this side of the Atlantic. A couple of songs in French are mixed in as well. While it appears that normally in live, Andrew does a solo act, on the album he is skilfully supported by a cast of folk musicians, on instruments such as accordion, mandolin, fiddle, washboard. This is an album full of fun and energy, enjoyable for young and old. Various Artists, Oak Ash Thorn. Folk Police Recordings, 2010. This is the "grey area" CD - is it for children or not? "Oak Ash Thorn" presents a collection of folk music adaptions of children's poems from Kipling, taking inspiration from and being based upon an album of the same name of Peter Bellamy from the early 70s. It may be children's poems - but this album does not have the flair of children friendly music at all. The music is often quite dark, and there is certainly not enough interest in each number to keep a child entertained. Yasmine does not like the album at all. This is certainly an adult album and, to be fair, it does not seem that the target audience is children. It is probably most directed to fans of Peter Bellamy, as well as to fans of the wider English folk music scene. There is certainly some well-known talent represented on the album - including Jon Boden, the Unthanks, Jackie Oates, Sam Lee and many more. Despite this range of different artists represented, and with the mix of traditional singers and representatives of the new and young British folk scene, I still find that the album for me lacks in variation - each song seems to go on for a long time. So in summary: There will no doubt be many English folk fans delighted by this album, and it certainly has a high quality of musicianship, but the CD is not my cup of tea - and even less so Yasmine's. And shouldn't an album of children's poems reflect a bit more childhood and have a flair that may appeal to children? Or maybe I am just too purist on this...?